More than a traditionnal method, Bombarde, How to is a collection of tips for beginning successfully the Bombarde (traditional woodwind instrument from Brittany) without solfeggio, in order to help self-learning this instrument then possibly moving smoothly to the biniou (the Breton bagpipe associated to the bombarde). You are allowed to freely copy and distribute the file, but without modifying, splitting or altering it and you must mention its original source. 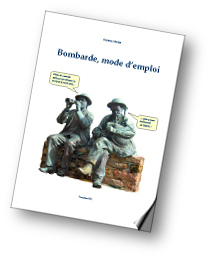 Bombarde, How to is published only in PDF format. To read this document, you must install a PDF reader if this is not already done. I translated myself this document in my poor broken English; any help from native English speaking musicians is welcome to improve the text. To be informed of upcoming new versions of this document (corrections and updating), enter your email address. This address will not be passed on or used for any other purpose.